One request heard frequently from users of DevExpress’s VCL controls is for an HTML editing control. So far this has been deferred by the folks at DevExpress. However, they do make a bang-up .NET control called XtraRichEdit which has great HTML editing functionality. Wouldn’t it be great if we could easily embed that control in a VCL application? It turns out this isn’t too tough using RemObjects’ Hydra product. Hydra is a plugin framework for both Delphi and .NET that lets you mix and match both managed and native hosts and plugins, visual and non-visual. This means you can make use of .NET visual controls in Delphi applications and vice-versa. Let’s take a look at how easy this is to do (hint – very easy). You’ll need Visual Studio, Delphi, the DevExpress WinForms controls, and Hydra all installed in the same environment. While it’s possible to do this with Delphi and Visual Studio on separate machines, it’s beyond the scope of this post. Create a new project in Visual Studio using the “Plugin Module” template in the “RemObjects Hydra” category. Afterward, use the “Add>New Item” dialog to create a new “Visual Plugin”. Add a RichEditControl to the new design surface and dock it in its parent. This alone is enough to yield a plugin module that can be loaded in a Delphi application and display a working RichEditControl. However, there would be no way to access the richedit’s HTML text. For this we will need to use a custom interface. This is really easy to do. And that’s it for the .NET side of things. 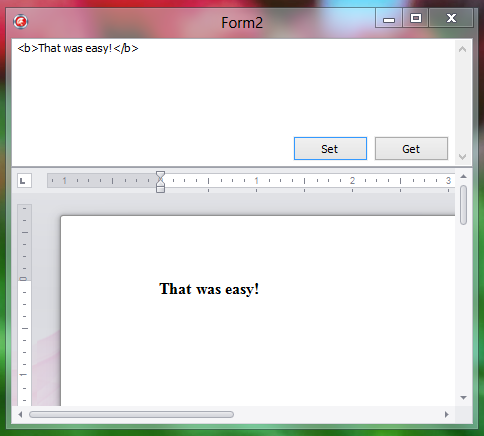 On the Delphi side of things, create a new VCL forms project. Add a THYModuleManager, TPanel, TMemo, and two TButtons. Click the Hydra menu followed by Import Interfaces from .NET Assemblies. Browse for the assembly created above and click Import on the dialog listing the IRichEditPlugin interface. Then, click the Hydra menu followed by Hydra Package Settings. Select “Build with Hydra Core Packages” and click OK.
FRichEditPlugin is a private field declared as IHYVisualPlugin. After you copy the assembly created in .NET (RichEditModule.dll in my example) to the same path as your debug executable, running the application will now show the Delphi application with the .NET RichEditControl embedded and fully functional. This new code will require adding the “_Import.pas” unit generated when you imported the .NET interface to your uses clause. And that’s it. Press the run button and then try the Get and Set buttons along with editing text in the RichEditControl. This is pretty powerful stuff thanks to Hydra and the XtraRichEdit, and very easy to do! You can download the C# and Delphi source code here. This entry was posted in Developer Express, Development, Embarcadero Delphi, Microsoft .NET, RemObjects on June 1, 2012 by Nathanial Woolls (Nate).